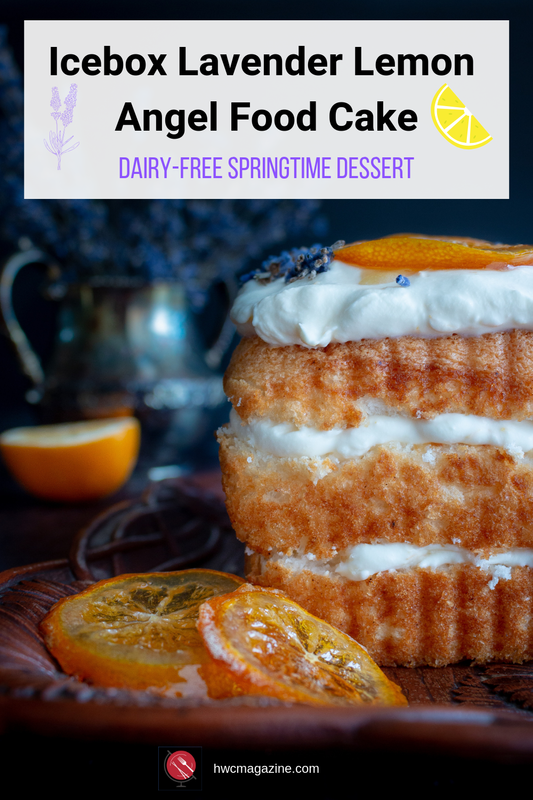 Icebox Lavender Lemon Angel Food Cake is light dessert with a lavender Meyer lemon honey dairy free topping between 3 layers of angel food cake. Almost homemade and a show stopper spring dessert. One delicious bite and you will be tasting a little bit of heaven. Whipped coconut cream is flavored with our Honey Candied Meyer Lemon Slices glazed that has been infused with culinary lavender. 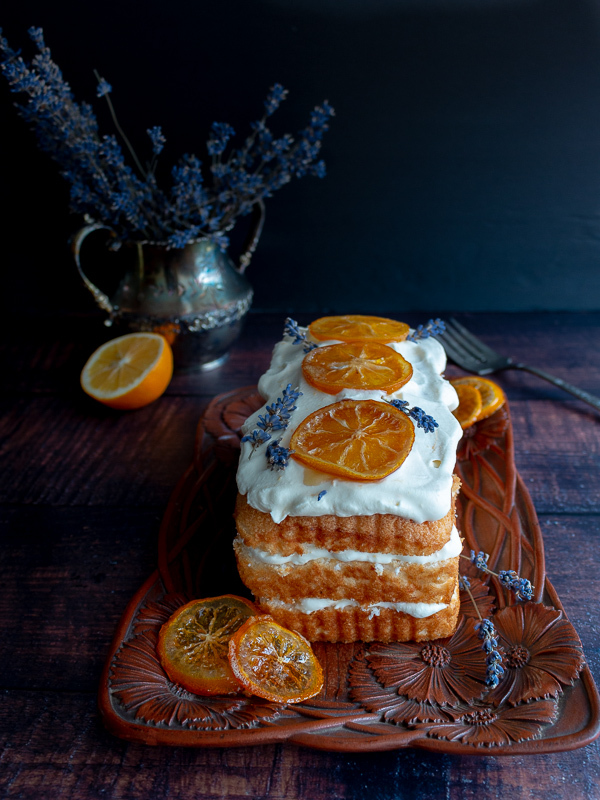 Stacked between 3 layers of pre-made angel food cake and garnished with Honey Candied Meyer Lemon Slices and fresh lavender. A calming and dainty cake pretty for showers, Mother’s Day, Easter or any day you want a special treat. We have a little secret to share… We did not bake the angel food cake, but our local grocery store makes the most delicious 10-ounce angel food cake loaves. If you are looking for a stunning cake but have zero time, this is the perfect recipe for you. In less than 30 minutes, you can have a delicious decked out cake ready to share. 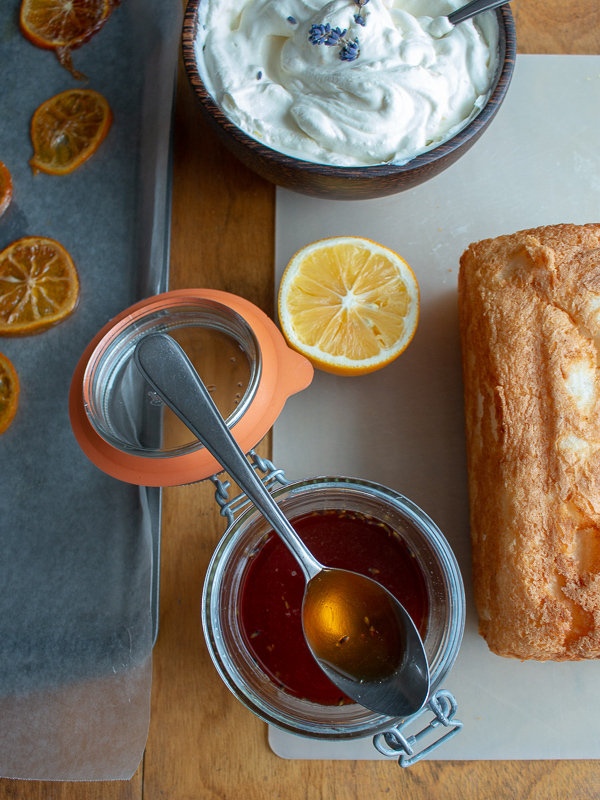 Bake your own angel food cake from scratch. What option would you like to try? We chose to go with option number 2. However, if you love to bake and have the time, then by all means make an angel food cake from scratch and go with option 1. Do you only have about 15 minutes to whip up a fabulous dessert? Then go with option 3. If you have 30 minutes and want to impress your guests or family, then go with option 2. All 3 dessert options are delicious but making your own Honey Candied Meyer Lemon Slices takes this cake to the next level. 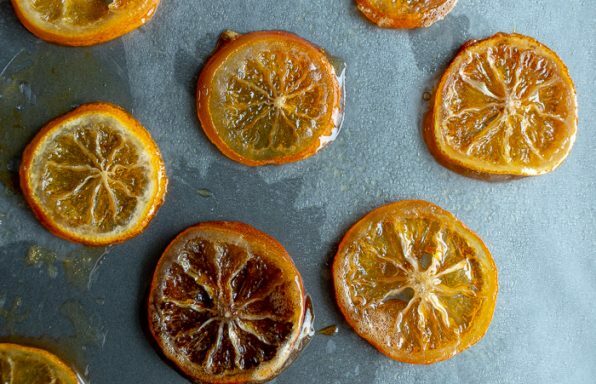 You can make these candied lemons in just 15 minutes while you are prepping the rest of your ingredients. How to make homemade coconut whipped cream? Dairy and us are NOT the best of friends. How about you? We have found we just feel so much better excluding dairy from our diet and it is really easy to do. These steps will help you make the perfect creamy coconut whipped topping. • Place your coconut cream, bowl and beaters in the refrigerator the night before at least 12 to 24 hours. You can also put your bowl and beaters in the freezer for 15 minutes before whipping. • Use full fat coconut “cream” not “milk”. You will obtain much more coconut whipped cream from one can of coconut cream vs coconut milk. If you use full fat coconut “milk”, there is only about ½ cream that separates to the top. However, if you use full fat coconut cream almost ¾ or more of the can is able to be made to coconut whipped topping. • Use a good quality full fat coconut cream. We have used Arroy- D pure coconut cream (14 oz) and Thai Kitchen coconut cream (14 oz) with pretty good results. 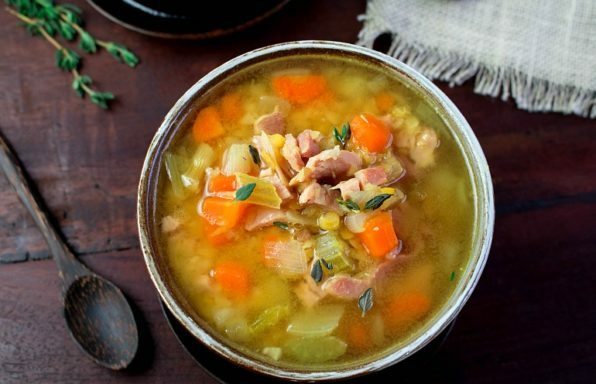 However, some brands are just not as good and do not have a high fat content or have thickeners or additives. Steer far away from those brands. • Do not over whip the coconut cream and you may need to add a little of the coconut water just to get it to the consistency you desire. If you whip it too long, it will turn to butter. 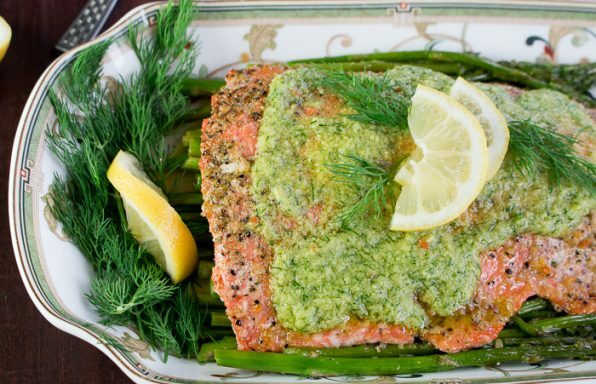 • Sweeten with a little our Lavender lemon honey glaze or sweetener of choice. • Best served after just whipped. 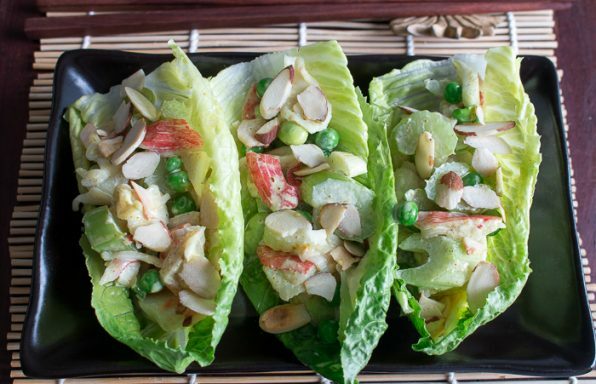 However, it can be stored in the refrigerator for up to 2 weeks with a sealable lid. Please note that the coconut whipped cream with harden a little as it sits so you may have to rewhip before serving to get it to the texture you desire. • Be sure to try our recipe for Velvety Vegan Chocolate Mousse is a luscious dessert with deep dark dairy-free chocolate and quality coconut cream that whips together in just under 15 minutes. • If you do well with dairy, be sure to try regular dairy whipping cream and make your own fresh whipped topping. Have you ever been to a lavender field? The aroma is so relaxing and restful. Last year we visited a lavender farm and purchased enough culinary lavender to dry and use through the year. Do you remember our recipe for Lemon Lavender Goat Cheese Spread? 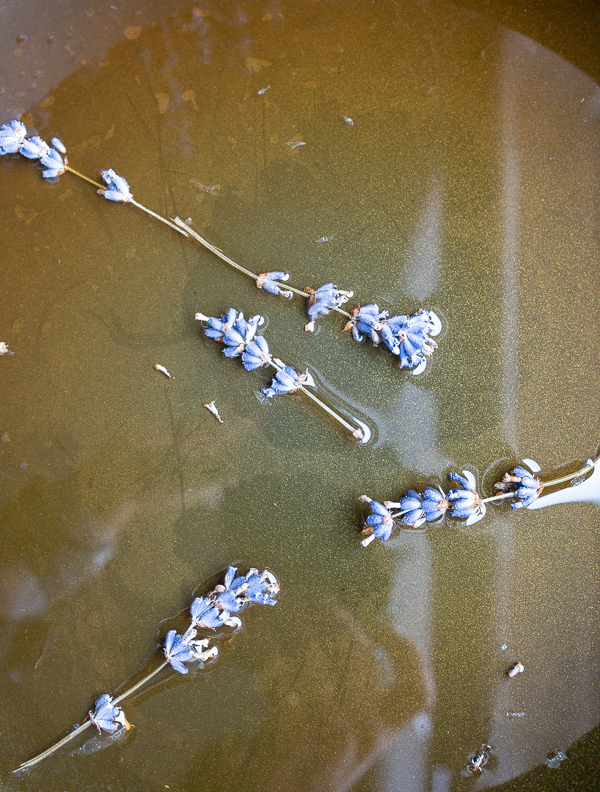 Lavender is such a lovely ingredient as it is slightly sweet and floral and helps ease nervousness and tension. We put a few springs in our Honey Candied Lemon Slice glaze to infuse and add a delicate floral and citrus essence. We also used a few dried culinary sprigs to garnish and it is so pretty. However, you can also use a few drops of “dietary” lavender essential oil in your coconut whipping cream too. (Just make sure you choose a dietary essential oil that is safe for consumption. Young Living makes a whole line of dietary essential oils) Both options work well. 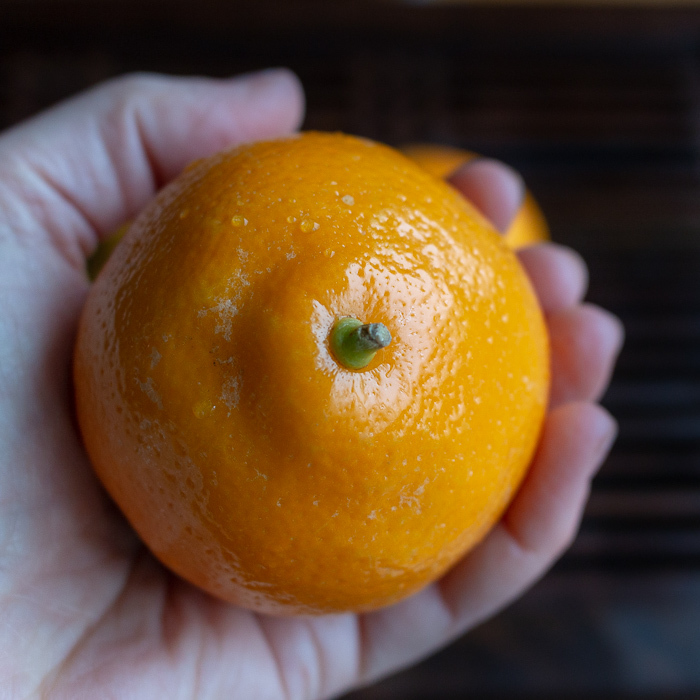 Meyer lemons are in season from late January to around April, but regular lemons are beautiful all year around and are delicious and refreshing in this recipe. The zest of 1 lemon and 3 tablespoons of our honey lavender lemon glaze was used to sweeten our whipped coconut cream. 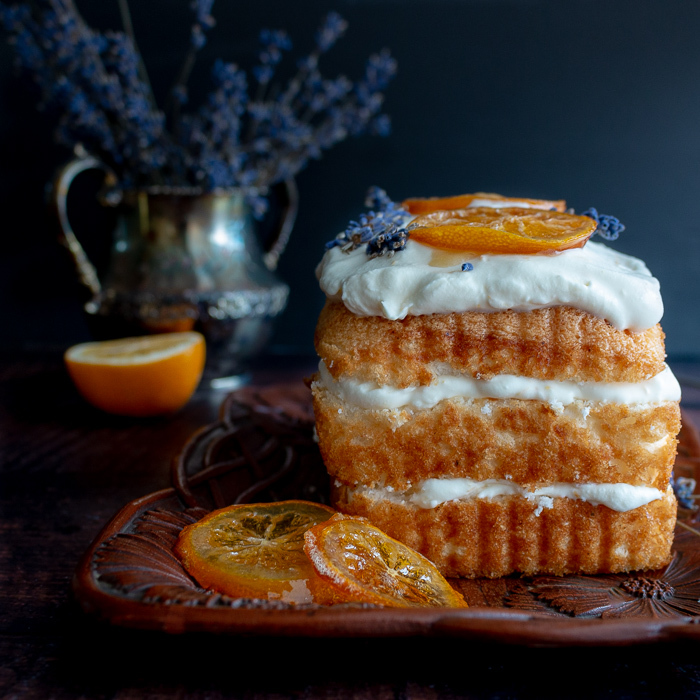 Icebox Lavender Lemon Angel Food Cake is light dessert with lavender Meyer lemon honey dairy free topping between 3 layers of angel food cake. Almost homemade and a show stopper spring dessert. Coconut cream (full fat) canned – 14 oz x 2 (2 cups of the coconut cream that rises up to the top after refrigerated overnight) Reserve a few tablespoons of coconut water to thin the coconut whipping cream. 1Make coconut whipping cream – place your cans of coconut cream in the refrigerator overnight or up to 24 hours in advance. 15 minutes before making your coconut whipping cream place your whipping bowl and beaters in the freezer to get them really cold. 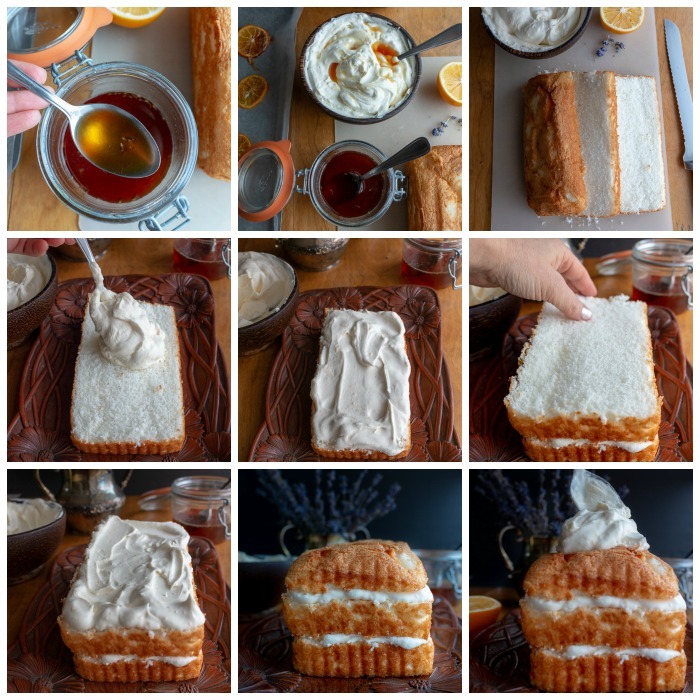 3Prepare the cake – Slice your angel food loaf cake into 3 horizontal slices. Place 1/3 of the Honey Lemon Lavender whipped coconut cream on top of the bottom layer of the prepared angel food cake and spread evenly. 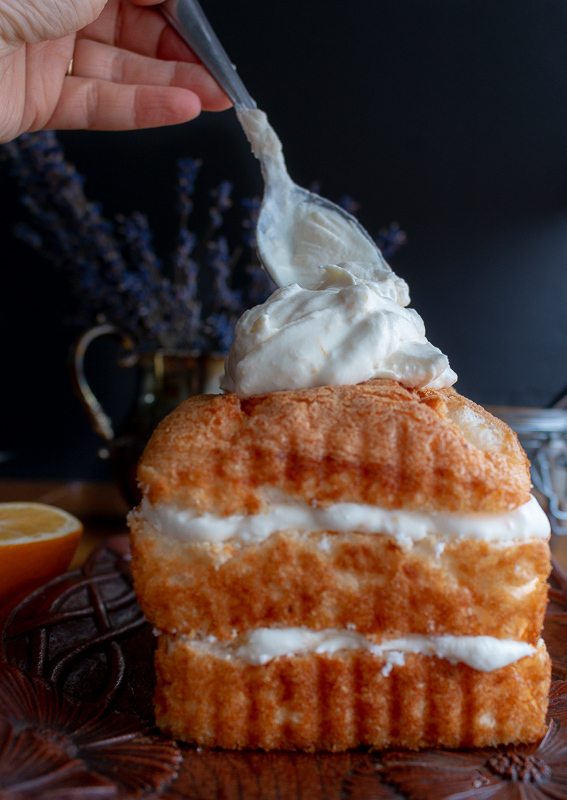 Place another slice of your angel food cake on top of the Honey Lemon Lavender whipped coconut cream. Repeat the process for a total of 3 layers. The top and final layer should have a lovely dollop of Honey Lemon Lavender whipped coconut cream. 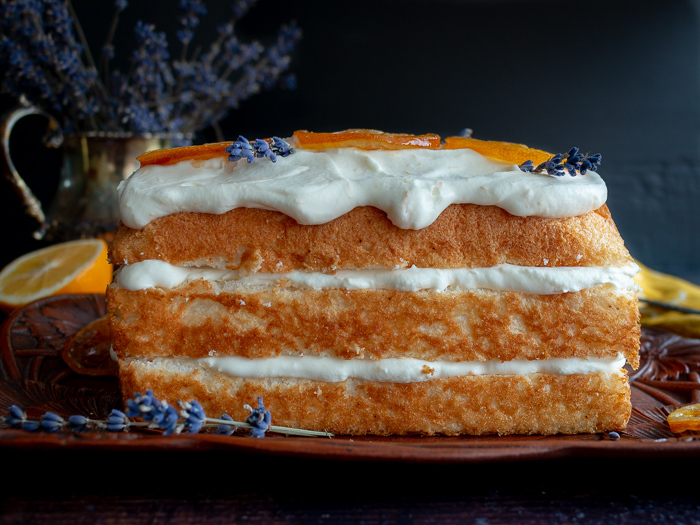 5Chef’s Notes: Icebox Lavender Lemon Angel Food Cake is best enjoyed on the first day or within 24 hours. Feel free to use fresh dairy whipping cream instead of coconut whipping cream if you do not have a dairy issue. If you use regular whipping cream and cover your cake in a sealed container, it will last for 3 days or until your family finds out about it and then it will be history. 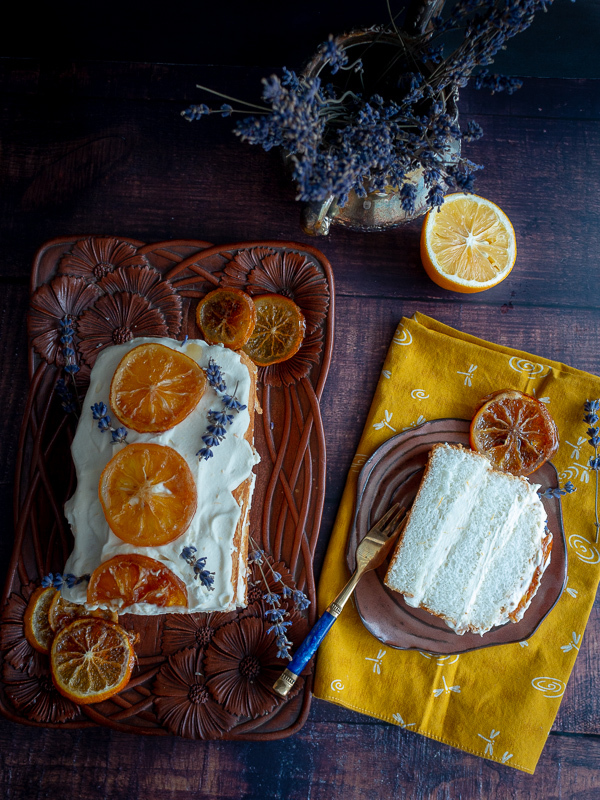 Garnishing with Honey Candied Meyer Lemon Slices takes this cake to the next level but if you are short on time, skip it and use fresh lemon slices. We loved using the leftover glaze from Honey Candied Meyer Lemon Slices to make Honey Candied Meyer Lemon Slices Lavender glaze to sweeten our coconut whipping cream. However, if you are short on time, grab a tub of pre-made whipping cream, add honey, lemon zest, lemon juice and a few drops of dietary/culinary Lavender essential oil and whip it all together. If you want to make a full-size angel food cake, double the recipe for coconut whipping cream and all the additions. 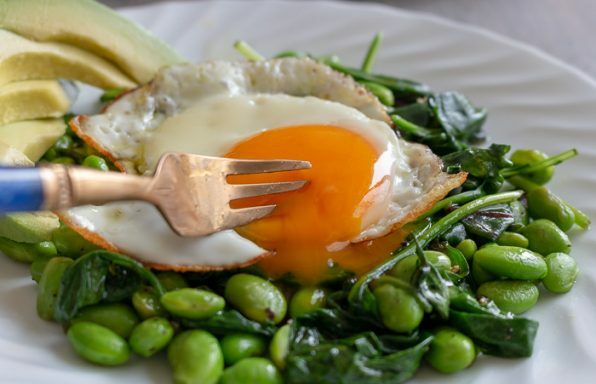 Copyright 2011-2019 Healthy World Cuisine. All rights reserved. 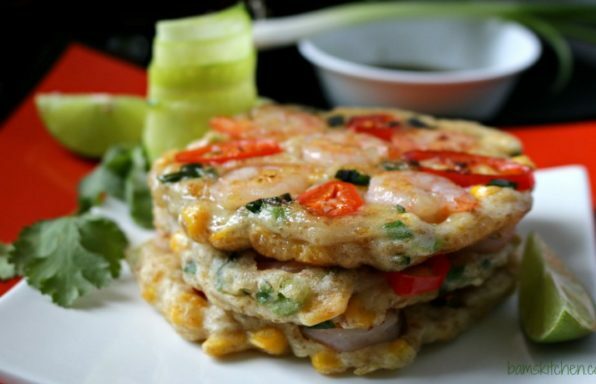 Sign up to our Newsletter to receive FREE Healthy World Cuisine Recipes and Fun and Easy Tips for Healthy Living.